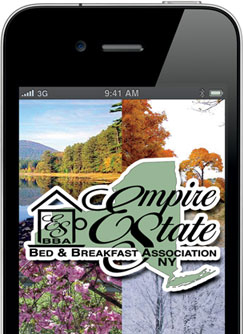 This NEW iPhone App allows users to quickly find every ESBBA member B&B and small Inns located in the state of New York. The application is a FREE offering to travelers provided by ESBBA in the hopes of making getaways easier to plan and remember. This recent version, designed specifically for the Empire State Bed and Breakfast Association, is the first application of its kind for any state bed and breakfast association and exemplifies the marketing plans developed by the forward-looking leadership of ESBBA. InnTouch is powered by iLoveInns.com. To download, iPhone users can simply go to the iTunes store and enter "ESBBA”. With many travelers making their reservations on the go, they can now explore wonderful bed and breakfasts and inns within a few miles of their location with just the tip of their finger. The websites esbba.com, nybnbinns.com, nybnbinns.mobi(mobi for mobile devices) and NOW the new ESBBA InnTouch App give travelers the tools to find bed and breakfasts, Inns, lodging and attractions throughout New York State. This superb iPhone InnTouch tool is available on the Verizon and AT&T networks. 2 Comments to "Mobile App for NY Bed and Breakfasts"